Internationally, efforts to increase student interest in science, technology, engineering, and mathematics (STEM) careers have been on the rise. It is often the goal of such efforts that increased interest in STEM careers should stimulate economic growth and enhance innovation. Scientific and educational organizations recommend that efforts to interest students in STEM majors and careers begin at the middle school level, a time when students are developing their own interests and recognizing their academic strengths. These factors have led scholars to call for instruments that effectively measure interest in STEM classes and careers, particularly for middle school students. In response, we leveraged the social cognitive career theory to develop a survey with subscales in science, technology, engineering, and mathematics. In this manuscript, we detail the six stages of development of the STEM Career Interest Survey. To investigate the instrument's reliability and psychometric properties, we administered this 44-item survey to over 1,000 middle school students (grades 6–8) who primarily were in rural, high-poverty districts in the southeastern USA. Confirmatory factor analyses indicate that the STEM-CIS is a strong, single factor instrument and also has four strong, discipline-specific subscales, which allow for the science, technology, engineering, and mathematics subscales to be administered separately or in combination. 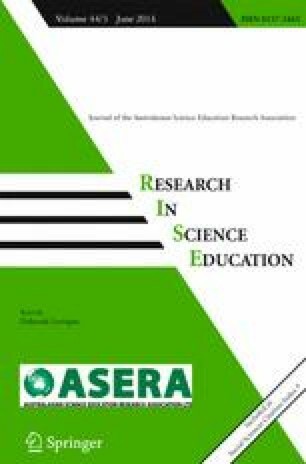 This instrument should prove helpful in research, evaluation, and professional development to measure STEM career interest in secondary level students. The authors wish to thank Michael D. Cobb for his helpful suggestions on the initial development of this instrument and all of the collaborators on this project who participated in this research. This research was funded by an ITEST grant (2010–2013) from the National Science Foundation (award number 1031118). The opinions expressed are those of the authors and do not represent the views of the National Science Foundation or North Carolina State University. I am able to get a good grade in my science class. I am able to complete my science homework. I plan to use science in my future career. I will work hard in my science classes. If I do well in science classes, it will help me in my future career. My parents would like it if I choose a science career. I am interested in careers that use science. I like my science class. I have a role model in a science career. I would feel comfortable talking to people who work in science careers. I know of someone in my family who uses science in their career. I am able to get a good grade in my math class. I am able to complete my math homework. I plan to use mathematics in my future career. I will work hard in my mathematics classes. If I do well in mathematics classes, it will help me in my future career. My parents would like it if I choose a mathematics career. I am interested in careers that use mathematics. I like my mathematics class. I have a role model in a mathematics career. I would feel comfortable talking to people who work in mathematics careers. I know someone in my family who uses mathematics in their career. I am able to do well in activities that involve technology. I am able to learn new technologies. I plan to use technology in my future career. I will learn about new technologies that will help me with school. If I learn a lot about technology, I will be able to do lots of different types of careers. My parents would like it if I choose a technology career. I like to use technology for class work. I am interested in careers that use technology. I have a role model who uses technology in their career. I would feel comfortable talking to people who work in technology careers. I know of someone in my family who uses technology in their career. I am able to do well in activities that involve engineering. I am able to complete activities that involve engineering. I plan to use engineering in my future career. I will work hard on activities at school that involve engineering. If I learn a lot about engineering, I will be able to do lots of different types of careers. My parents would like it if I choose an engineering career. I am interested in careers that involve engineering. I like activities that involve engineering. I have a role model in an engineering career. I would feel comfortable talking to people who are engineers. I know of someone in my family who is an engineer. American Association of State Colleges and Universities (2005, November/December). Strengthening the science and mathematics pipeline for a better America. Policy Matters, 2(11), 1–4. Retrieved from http://www.aascu.org/uploadedFiles/AASCU/Content/Root/PolicyAndAdvocacy/PolicyPublications/STEM%20Pipeline.pdf/. American College Testing (2011). The condition of college and career readiness 2011. Retrieved January 3, 2012 from http://www.act.org/research/policymakers/cccr11/. Business Europe (2011). Plugging the skills gap: The clock is ticking. Retrieved September 6, 2013 from http://www.businesseurope.eu/Content/Default.asp?pageid=568&docid=28659. Cataldi, E.F., Green, C., Henke, R., Lew, T., Woo, J., Shepherd, B., and Siegel, P. (2011). 2008–09 Baccalaureate and Beyond Longitudinal Study (BB:08/09): First Look (NCES 2011–236). US Department of Education. Washington: National Center for Education Statistics. Retrieved February 4, 2012 from http://nces.ed.gov/pubs2011/2011236.pdf. Change the Equation. (2010). Change the Equation: Improving learning in science, technology, engineering, and mathematics. Retrieved December 28, 2012 at www.changetheequation.org. Drew, C., (2011, November 4). Why science majors change their minds (It's just so darn hard). The New York Times. Retrieved from http://www.nytimes.com/2011/11/06/education/edlife/why-science-majors-change-their-mind-its-just-so-darn-hard.html?pagewanted=all. Healy, J., Mavromaras, K., Zhu, R. (2011). Consultant report securing Australia's future STEM: Country comparisons. Retrieved September 6, 2011 from http://www.acolasecretariat.org.au/ACOLA/PDF/SAF02Consultants/Consultant%20Report%20-%20Australian%20Labour%20Market.pdf. Hill, C., Corbett, C., St Rose, A. (2010). Why so few? Women in science, technology, engineering, and mathematics. Washington: American Association of University Women. Retrieved March 22, 2011 at http://www.aauw.org/files/2013/02/Why-So-Few-Women-in-Science-Technology-Engineering-and-Mathematics.pdf. National Science Foundation. (2009). Women, minorities, and persons with disabilities in science and engineering: 2009. Arlington: National Science Foundation. Retrieved January 8, 2013 at http://www.nsf.gov/statistics/wmpd. Regisford, K. (2012, November 20). Life and work in a global city—The need to improve STEM education. The Recruitment & Employment Confederation. Retrieved November 2, 2012 from http://www.rec.uk.com/press/news/2253. Scott, A. & Martin, A. (2012). Dissecting the data 2012: Examining STEM opportunities and outcomes for underrepresented students in California. Retrieved from May 15, 2012 from http://toped.svefoundation.org/wp-content/uploads/2012/04/Achieve-LPFIstudy032812.pdf. STEMconnector® (2012). Where are the STEM students? National Report, Washington. Retrieved September 6, 2012 from http://www.stemconnector.org/sites/default/files/store/STEM-Students-STEM-Jobs-Executive-Summary.pdf. US Bureau of Labor Statistics (2010). Occupational outlook handbook, (2010–2011 ed.). Office of Occupational Statistics and Employment Projections. Retrieved January 9, 2012 from http://www.bls.gov/oco/oco2003.htm. White House Office of Science and Technology Policy (2012, February 13). Preparing a 21st Century workforce: Science, Technology, Engineering, and Mathematics (STEM) education in the 2013 Budget. Retrieved May 30, 2012 from http://www.whitehouse.gov/sites/default/files/microsites/ostp/fy2013rd_stem.pdf.